Today marks 10 years since I first set foot in Uganda, and a lot has happened and a lot has changed since then. It was a strange first trip; I knew I had to be there, but felt like a spare part – I didn’t like the heat, I didn’t like flying, and wasn’t particularly fond of children. I went as part of a team from South Wales that included Jan and Paul Thomas (Founders and Trustees), Paul Booth (who became a Trustee at the same time as me) – a head teacher – and a number of his staff, all who were very organised, confident and full of life, and me – who was neither confident nor full of life. My first impression of the children’s home was a lasting one! We were greeted at the gate by children and staff singing and dancing – it was such a lovely welcome. During my first trip, I felt very much like a spare part – all the teachers were full of enthusiasm and had a purpose. I took the team camera and took photos, but felt like a fly on the wall. When I came home however and my wife asked about my trip, and apparently I didn’t stop for breath for an hour and a half, so something had happened! What a change! In May 2009 I became Treasurer and Trustee for the charity and since then things have been fairly full on. Since 2009 I have visited Uganda twice a year most years, and have set up the website and various social media channels. Since 2010, a lot of evenings and weekends were spent with the back office operation of the charity. Having returned from Uganda in February 2015, I cut my working week to 4 days so that I could spend every Friday working for the charity in an attempt to get more work done and to re-balance my evenings and weekends. Since August 2016 I was even more aware of the work that needed to be done, and so I handed my notice in, and since the end of November 2016, I have been able to spend more time working for the charity. The focus has been looking to increase regular giving; building a stronger online presence; working with Victory Child Care Project more in order to identify projects which need our help, and then looking for funding so that we can make these projects a reality. Over the years, the numbers of children in care increased year on year, but since 2015, the number of children who were admitted to the children’s home for medium to long term residential care has drastically reduced. This raises some key questions; are we seeing a decline in children needing support, or are there other factors at work? There are still orphans and vulnerable children who need support, but the ways in which we can support these children is now far more varied than it used to be. In days gone by, there was a “one-size fits all” approach. For some children that was lifesaving, but for others, it was a bit like using a sledgehammer to crack a nut. There was just the one solution for all children needing support, and that was to place them in a residential care institution where they would receive the best care possible until they became adults. There was no differentiation between orphans and vulnerable children, and so even though circumstances and possible solutions could be quite different, there was just the one solution for all, residential care. Over the years, thinking has been challenged, and the approach towards supporting children who need the intervention of others, has drastically changed. Now, there are many solutions and options available to the social work team, and it is their job to recommend the care plan most suitable to the situation, whilst ensuring that their recommendations are at all times, made in the best interest of the child. There is no doubt that in the early days, AIDS played a major part in the increase of orphans and vulnerable children seeking care. With the advancement of medicine, thankfully AIDS is no longer the death sentence it once was, and therefore the number of children orphaned or vulnerable because of AIDS is reducing. With natural factors to one side, there are also a number of other major factors which we have identified, that have resulted in the decrease of children needing to taken into care for the medium to long-term. Knowledge and Understanding Our thinking has been challenged - just because something has always been done a certain way, it does not mean that it is the right way or even the only way. I think that has been the key to change, being able to adapt to needs, and to look for more suitable care plans, care plans to support and strengthen children and families, and ways to prevent abandonment occurring in the first place. Vulnerability does not have to be Permanent In the past, children throughout Uganda and probably Africa as a whole, were placed in care due to vulnerability. These vulnerabilities could be financial, medical or because of abuse. But in most cases, with the right support, these vulnerabilities can be reduced, or even removed. 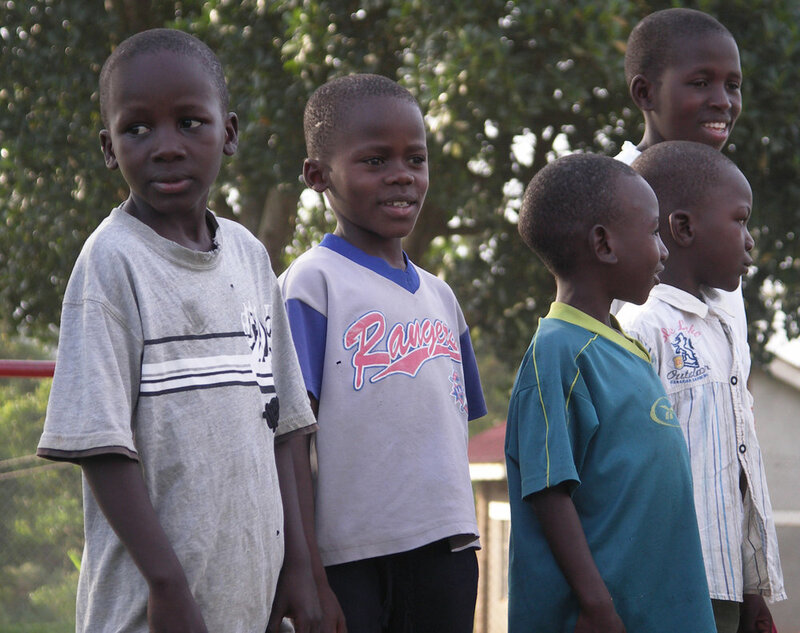 Education In Uganda education is free, but there are associated costs for uniforms, pens, pencils, books, food etc which quite often mean that the parent or parents cannot afford to educate their children. Add this to the fact that Ugandans tend to have far more children than we do in the Western world, and the problem gets a whole lot worse. In many cases, they cannot afford to eat and educate the family, so education suffers. Unfortunately, this can also lead to other dangers as children are not in school during the day and can be left to look after themselves while parents are away at work. In a country where child trafficking and child sacrifice still exist, it is easy to see why a parent would rather their child grow up in residential care. Sometimes, being able to offer financial support for school fees will relieve the burden and enable the family to stay together. It can provide hope to the parents, and give them an opportunity to get their heads above the water. Medical Needs There is no free health service in Uganda – if you need treatment, you need to pay. Some children need ongoing medical care, and some need emergency one-off care, but once again, some parents feel that if their child is in residential care, the institution would be better placed to support their child’s medical needs than they would. Some children who need life-saving or life-changing medical treatment can become a burden on their family – a parent needs to work to provide for their family, but cannot give the time needed to care for the family. We have recently paid for two umbilical hernia operations – one life-changing, and one life-saving – and the difference that this has made to each family has been huge, it really has. Preventative Abandonment and Community Strengthening Over the last few years, we have become more aware of issues facing teenage girls. Due to the cost of sanitary-wear, girls will miss school one week out of every four, or miss school completely as the family would rather pay for a boy to be educated four weeks out of four. As part of our “Keeping Girls in School” project, we provide reusable sanitary-wear and menstrual education for girls within the local community, helping to keep them safe and keep them in school. As well as working to prevent abandonment and keep families together, we now also work to resettle children at the Children’s Home, back in their families, so that they can have an opportunity to grow up in a family environment. The social work team trace relatives, carry out sensitisation and assessments, and if suitable, work with the family to resettle the child. This is not a quick process, and placement is only made if it is in the best interest of the child. If relatives cannot be found, or if it is not suitable for the child to be resettled with their family members, then the social work team look for foster families for them to be a part of. Assessments are made prior to resettlement/foster placement, and special care is given to see what support the family/foster family need in able to care for the child. As well as mentorship and encouragement, it is vital to ensure that the child and family do not slip back into vulnerability due to poverty. Quite often, a school fees and health support financial package is put in place to ensure that the child continues to be educated, creating an opportunity to break the cycle of disadvantage and poverty. · 15 are currently supported by Tŷ Cariad Africa, but are waiting for sponsors. To ensure that all children receive the support that they need, we as an organisation pay the education costs for all the children. The children are not aware of who has, and who hasn’t got a sponsor. We feel that this is the best way, so that children do not get let down or feel left out or feel unworthy. The children write the letters to “the project” and will never get to know of a sponsor’s involvement, but please be assured that together, we make a huge difference to the sponsored child and their family. · A recent picture of their sponsored child. We are currently looking for sponsors for 3 Nursery children (£20 per month each); 3 Primary children (£25 per month each); 10 children from Primary 7 through to Senior 4 (£30 per month each); and 3 A level/Vocational students (£40 per month each).